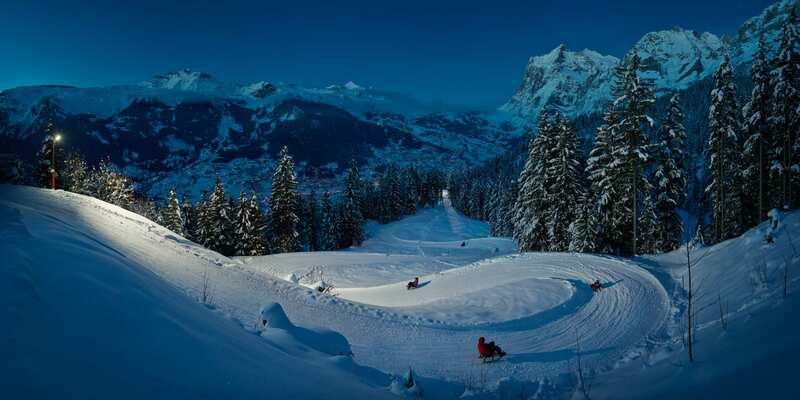 In the shadow of the Eiger with a dash into the valley: The Eiger Run is a spectacular sledging run by day with a gradient of up to 36 per cent. However, the 3.5 kilometre stretch from Alpiglen to Brandegg is even more exciting at night. The Wengernalpbahn also travels to Alpiglen in the evening – in just five minutes and as often as you like with the "Eiger Run Evening Ticket". The burned calories can be quickly regained with a fondue in the Alpiglen or Brandegg alpine chalets, where you can stay up all night – right next to the illuminated sledging run. *Only in good weather.<br/> Bus connection in Grindelwald to Interlaken Ost only on Fridays and Saturdays. The "Eiger Run Evening Ticket" is valid on evening trains from 17.47 for any journey between Grindelwald and Alpiglen (Brandegg – Alpiglen shuttle train). Junior Travelcard and Children's Co-Travelcard and Swiss Family Card are valid.<br/>No additional discounts with the Half Fare Card, General Pass, etc.<br/>The "Eiger Run Evening Ticket" is available at all Jungfrau Railway stations.